"Maria" is a song by the American band Blondie, taken from their 1999 album No Exit. 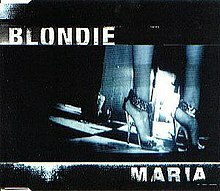 The band's first single release since "War Child" in July 1982, "Maria" marked Blondie's return to the charts after an almost 17-year absence. It reached number one in the United Kingdom; Blondie's sixth UK chart-topper (and their first since 1980). (1999) "Nothing Is Real but the Girl"
US edition of the "Maria" single with alternative cover art. "Maria" was written by the band's keyboardist Jimmy Destri, who had also penned some of their earlier hits such as "Atomic". A line from the song: "...like a millionaire/walking on imported air", was used in a previous Blondie track, "Walk Like Me" (also written by Destri), from the album Autoamerican (1980). In the UK, "Maria" was released as a two-CD set, the first containing remixes of the song, and the second containing live versions of "Screaming Skin" (a track from the No Exit album), and their very first hit single "In the Flesh". Both were recorded during Blondie's No Exit Tour. The song gave Blondie their sixth UK number-one single (and their first chart-topper in 18 years, after "The Tide Is High" in November 1980). 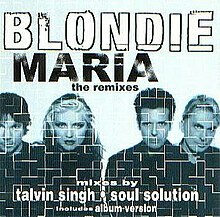 Topping the singles chart in February 1999, the release of "Maria" came exactly 20 years after Blondie's first number-one hit, "Heart of Glass". "Maria" also topped the charts in Greece and Spain, and was a top 10 hit in Austria, Belgium, Germany, Iceland, Ireland, Sweden and Switzerland. In the US, however, "Maria" was not a successful hit for the band, stalling at number 82 on the Billboard Hot 100, although it did reach number 14 on the Adult Top 40 listing. The song was included on the 2014 compilation album Greatest Hits Deluxe Redux. The compilation was part of a 2-disc set called Blondie 4(0) Ever, which included their tenth studio album, Ghosts of Download, and marked the 40th anniversary of the band's formation. The music video for "Maria" was directed by Roman Coppola (credited as Alan Smithee), and is set in New York City. Parts of New York through night-vision goggles are seen before zooming into an apartment where Blondie are performing. Mysterious dark-clothed individuals are seen spying around different buildings setting up spy equipment. Toward the end of the video, one of the dark-clothed individuals aims a sniper rifle towards lead singer Deborah Harry, and fires a bullet at her. Smashing through a window, a light bulb and the microphone, Harry simply grabs the bullet from the air and examines it as the surveillance systems are switched off. All tracks written by Jimmy Destri unless otherwise noted. Tracks 2 and 3 recorded at the Lyceum Theatre, London on 22 November 1998. ^ "Maria~ England CD #1". Recmod.com. Retrieved 2014-04-01. ^ "Maria~ England CD #2". Recmod.com. Retrieved 2014-04-01. ^ a b "Blondie: Artist Chart History". Official Charts Company. ^ "Blondie - Chart history". Billboard. Retrieved 2014-04-01. ^ "Blondie - Maria Dubs (Vinyl) at Discogs". Discogs.com. Retrieved 2014-04-01. ^ "Maria~ Thailand CD (Promo)". Recmod.com. Retrieved 2014-04-01. ^ "ariaNET The Chart! 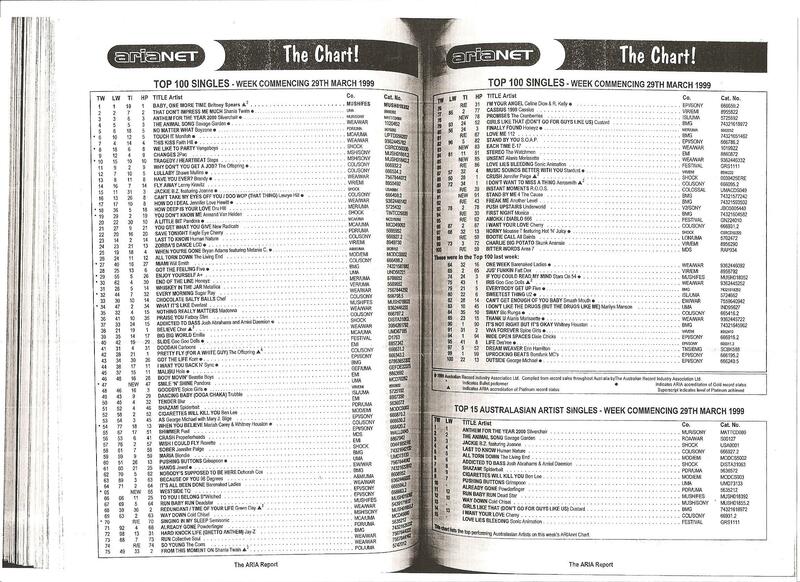 Top 100 Singles – Week Commencing 29th March 1999". ARIA. Retrieved 2016-03-27. ^ "Austriancharts.at – Blondie – Maria" (in German). Ö3 Austria Top 40. ^ "Ultratop.be – Blondie – Maria" (in Dutch). Ultratop 50. ^ "Ultratop.be – Blondie – Maria" (in French). Ultratop 50. ^ "Top RPM Singles: Issue 7445." RPM. Library and Archives Canada. ^ "Top RPM Adult Contemporary: Issue 8130." RPM. Library and Archives Canada. ^ "Lescharts.com – Blondie – Maria" (in French). Les classement single. ^ "Offiziellecharts.de – Blondie – Maria". GfK Entertainment Charts. ^ "Top 10 Greece" (PDF). Music & Media. Retrieved 9 May 2018. ^ "Íslenski Listinn Topp 40 (NR. 319 Vikuna 16.4. - 23.4. 1999)" (PDF) (in Icelandic). Dagblaðið Vísir. Retrieved 14 July 2018. ^ "The Irish Charts – Search Results – Maria". Irish Singles Chart. ^ a b "I singoli più venduti del 1999". Hit Parade Italia (in Italian). Retrieved June 10, 2018. ^ "Dutchcharts.nl – Blondie – Maria" (in Dutch). Single Top 100. ^ "Charts.nz – Blondie – Maria". Top 40 Singles. ^ "Notowanie nr894" (in Polish). LP3. March 19, 1999. Retrieved March 1, 2019. ^ "Spanishcharts.com – Blondie – Maria" Canciones Top 50. ^ "Swedishcharts.com – Blondie – Maria". Singles Top 100. ^ "Swisscharts.com – Blondie – Maria". Swiss Singles Chart. ^ "Blondie Chart History (Hot 100)". Billboard. ^ "Blondie Chart History (Adult Pop Songs)". Billboard. Retrieved July 6, 2017. ^ "Jahreshitparade Singles 1999" (in German). Retrieved January 27, 2019. ^ "Jaaroverzichten 1999" (in Dutch). Ultratop. Retrieved June 10, 2018. ^ "JAAROVERZICHTEN - Single 1999" (in Dutch). MegaCharts. Retrieved June 10, 2018. ^ "Årslista Singlar - År 1999" (in Swedish). Hitlistan. Archived from the original on October 6, 2014. Retrieved June 10, 2018. ^ "Swiss Year-End Charts 1999" (in German). Retrieved January 27, 2019. ^ "Best Sellers of 1999: Singles Top 100". Music Week. London, England: United Business Media. January 22, 2000. p. 27. ^ "Ultratop − Goud en Platina – singles 1999". Ultratop. Hung Medien. ^ "Gold-/Platin-Datenbank (Blondie; 'Maria')" (in German). Bundesverband Musikindustrie. ^ "Guld- och Platinacertifikat − År 1999" (PDF) (in Swedish). IFPI Sweden. Retrieved 6 March 2019. ^ "British single certifications – Blondie – Maria". British Phonographic Industry. Select singles in the Format field. Select Silver in the Certification field. Type Maria in the "Search BPI Awards" field and then press Enter.